Vancouver, British Columbia--(Newsfile Corp. - September 20, 2018) - Contact Gold Corp. (TSXV: C) (the "Company" or "Contact Gold") is pleased to report step out and exploration drill results, including high-grade and oxide results from an additional eight holes from the Bowl Zone at the Pony Creek gold property ("Pony Creek"). Drilling is still underway, with assays currently pending for 10 additional drill holes. Pony Creek is located on the Carlin Trend in Elko County, Nevada, adjacent to Gold Standard Ventures' Railroad-Pinion Project. "Pony Creek continues to deliver excellent results as we step out and explore with improved understanding the geologic structures that control the higher grade and better oxidized gold mineralization at the Bowl Zone. These drill hole intercepts are from two areas of the Bowl Zone that were sparsely drilled in the past and remain open for continued expansion," stated Matt Lennox-King, CEO of Contact Gold. "These results from the Bowl Zone, along with the new discovery at the West Target, continue to set the stage for a very productive 2019, with clear opportunities for continued growth at both areas." Holes 33, 34, and 35 are 100 meter step outs north from previously reported step-out holes on the Bowl Zone's west side (see news release June 21, 2018). Holes 28 and 29 are a further 100 meters north from 33, 34 and 35 and establishes 200 meters strike length of new gold mineralization to the west side of the Bowl Zone. The Bowl Zone has over 100 drill holes to date. Results include both step-out and infill drilling; and confirm higher grade gold mineralization than the grade of the historical mineral resource estimate. The Bowl Zone remains open for further expansion, with step-out and infill drill holes demonstrating continuity of gold mineralization. Gold mineralization at the Bowl Zone is associated with multiple cross cutting NW and NE striking faults intersecting what is interpreted to be the same major north-south structure zone associated with oxide gold mineralization, and in the same host rock, as at Gold Standard Ventures' Dixie and North Dark Star deposits. 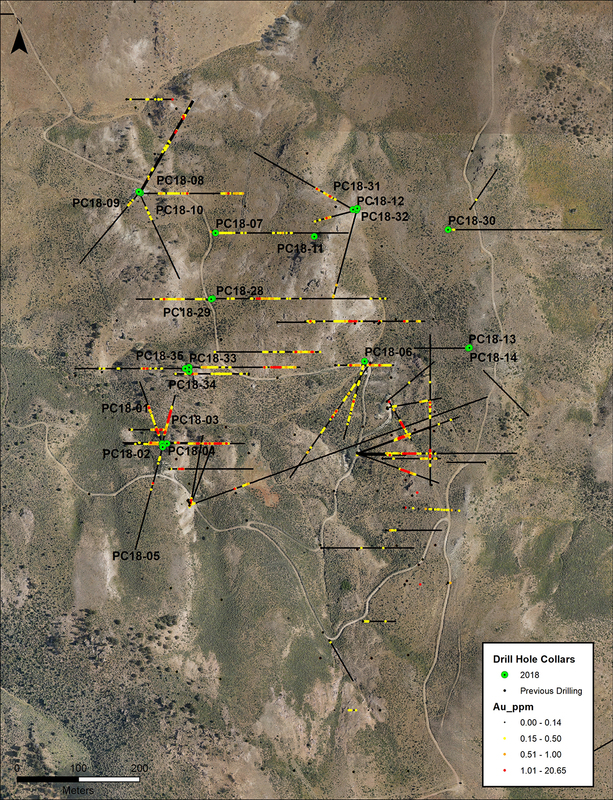 Drilling at Pony Creek through 2018 is designed to expand mineralization at the Bowl Zone, and to test new large scale targets, including the West Target, the North Zone, the Moleen, and Elliot Dome targets, generated by Contact Gold since acquiring the property one year ago. The Company has completed 41 holes in 2018, totaling over 9,200m of drilling.